High Polished 18k rose gold, with 27 diamonds hand set on the mother dial, and 12 diamonds set on the bezel. 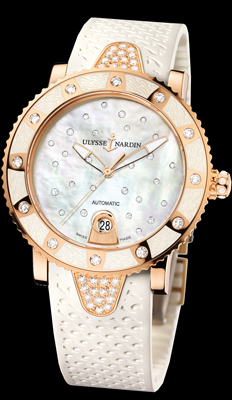 It features as exhibition case back, with a visible rose gold rotor with 30 dias set on rotor. Show on matching white rubber strap, and rose gold folding buckle. View our other Ulysse Nardin luxury timepieces. CALL US 956.687.2981.